An abandoned railway, a historic bridge, an empty building, an old industrial site, what do these infrastructures have in common? These “leftover” spaces are becoming attractive sites for urban planners and architects interested in creating people-friendly spaces and community amenities. 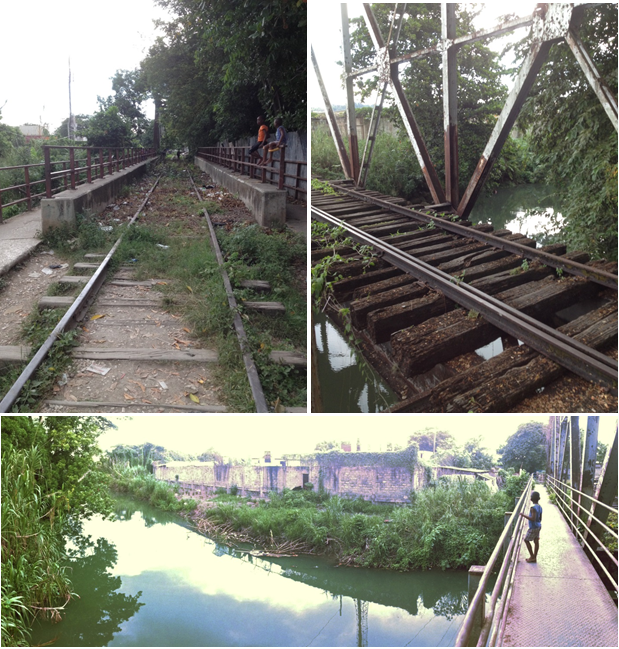 Recently, while visiting a neighborhood in Montego Bay, Jamaica we walked over an abandoned railway bridge. No longer a corridor for trains, it is now being used by the local community to cross over the Montego River. During the 15 minutes I was there, I saw heavy foot traffic of all ages, but particularly children crossing this bridge to get to a nearby school. Similar to what I saw in Xalapa, Mexico, it seemed that this bridge had also been taken over by pedestrians because it offered a faster, more direct route through the city. If it wasn’t for this bridge it would take these students at least 30 minutes to get to their school in the heavy car traffic of Montego Bay. The first thought that came to my mind was the danger of such heavy foot traffic across an old infrastructure that does not receive any type of maintenance. Given the bridge wasn’t designed for pedestrians I worried that someone could fall in the river. I imagined how nice it could be if this natural corridor, selected and utilized by the residents of Montego Bay, was better adapted to their needs, making it safer and more attractive to pedestrians and bicycles, better connecting it with the surrounding communities. My mind immediately went to New York’s High Line – a park that runs along the lower west side of Manhattan for 1.45 miles (2.33 kilometers). Once an elevated railway, it went out of use in 1980 and was facing demolition until a non-profit group came up with the idea of preserving the structure and reusing it as a public park. Now owned by the City of New York this project has been a facelift for the neighborhood and attracts many visitors from the entire world (3.7 million in 2011). 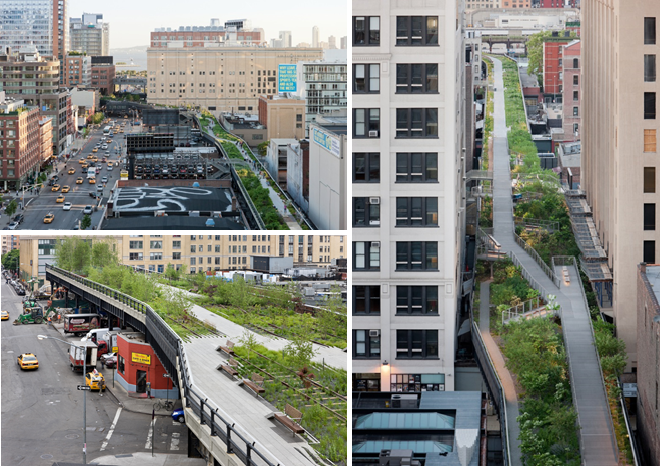 Since its opening, cities around the world have sought to replicate the success of the High Line. Everyone wants a High Line, but not every city has an abandoned elevated railway, the economic/financial potential and the high standard in terms of design that a city such as New York has. A project such as the High Line implies significant time and financial investment, therefore, it’s often not only not feasible for many of the (intermediate-sized) cities where we work, it also may not even be practical or appropriate. What is important about the High Line, though, is that it communicates a powerful message about the importance of creating public spaces for the people. Not all cities may have the resources to replicate a project like the High Line, but through small interventions they can echo the prioritization of public space. could this railway bridge in Montego Bay be transformed into another High Line? And, perhaps more importantly, should it? Because the bridge is no longer in use, there is certainly an opportunity there. It already provides easy access from one point to another, serving a valuable need to the local community by helping them avoid car traffic. But perhaps we could go further, and re-envision the area to help it achieve its full potential as an active public space that will enhance the neighborhood. Perhaps an effort as complex as the High Line is not what is necessary here, but rather an intervention that takes the local context into account. In other words, the message here may not be emulating the High Line’s success by converting an abandoned railway bridge, but rather emulating the thinking behind it and finding ways to repurpose “leftover” spaces in a way that favors the citizens and communities. How can we be innovative and creative with the “leftover” spaces in our cities and develop uses that benefit the local community? I invite you to explore your city and think creatively about how an abandoned space can be transformed. And I would love to hear your ideas here in the comments. I see this as a very worthy idea, really worth the effort. However your biggest hurdle will be government bureaucracy and lawlessness. I think perhaps you are not Jamaican, and that would be if your favor for this project, up to a certain point. The regular Jamaican citizens will applaud your work and be quite supportive, however watch out for the petty kings and bandoolus.